Well today has been “interesting” in the extreme. It appears we are now viral. Get us! The Brain Farts, as Jo calls them, are out in force and we have been accused of promoting over-breeding, photoshopping (I mean I am good in as much as I can erase a Twix wrapper from a photo of Scalloway Castle, but I am not THAT good! 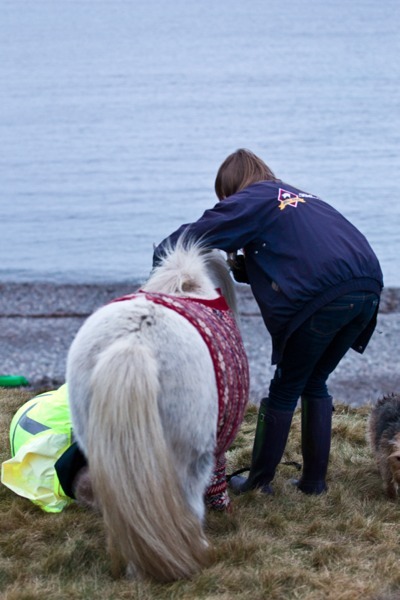 ), leaving the jerseys on all the time for the ponies to wear, over-heating the ponies (they were not standing in that freezing weather! ), etc. I have also been asked a few times for the name of the person who made the jerseys so they can order some for their equines. Now this is not a good idea. 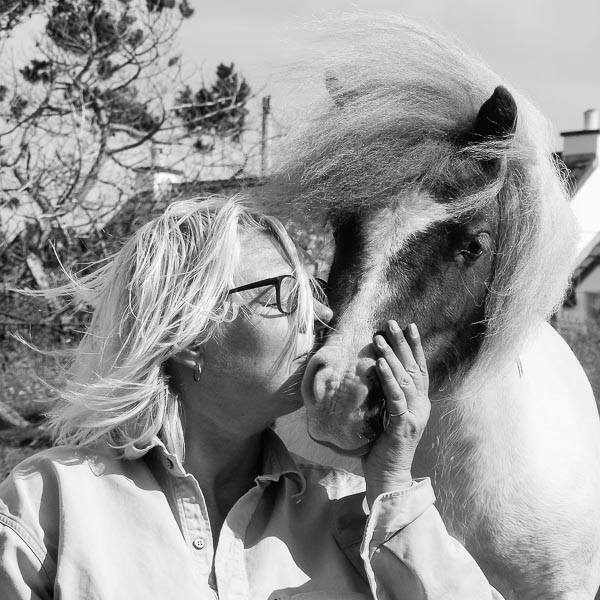 Originally, when the idea was first mooted to us, Jo and I looked around our myriad of Shetland ponies to find the right pony for the job. Whiffy Chicken of Lerve (aka Fivla) and her friend Minnie (Vitamin) were our only choice. They are kind, gentle and very very quiet. The rest would not have been quite so accommodating about having folk under their bellies doing buttons up. Heads would’ve been kicked in and we never thought to attempt it. 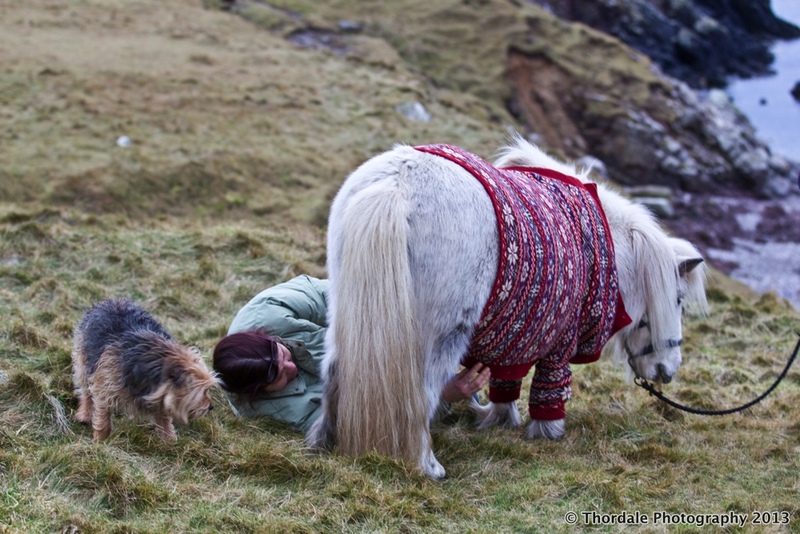 I have put up some photos of Robert, Daisy and Jo putting the jerseys on the ponies. DO NOT ATTEMPT THIS AT HOME! For those that want the pattern or one made up, I have spoken to the lady what made them, and she has refused point blank to ever make them so please do not contact me asking for one. It is not going to happen. 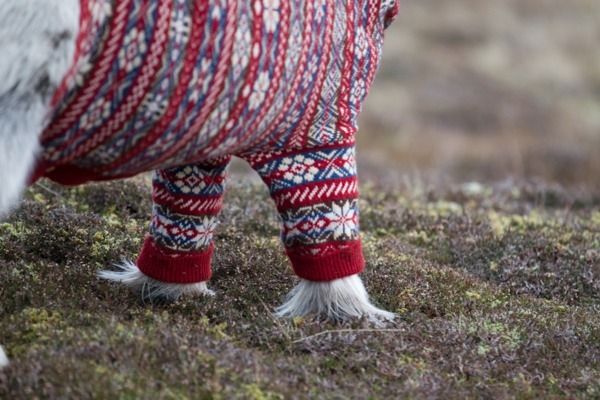 I know, I know the feet are extra cute but that is the way it is. Enough with the brain fartery. This entry was posted in MyShetland on January 23, 2013 by Frances. Hooray for such a darling, daring one time deal! 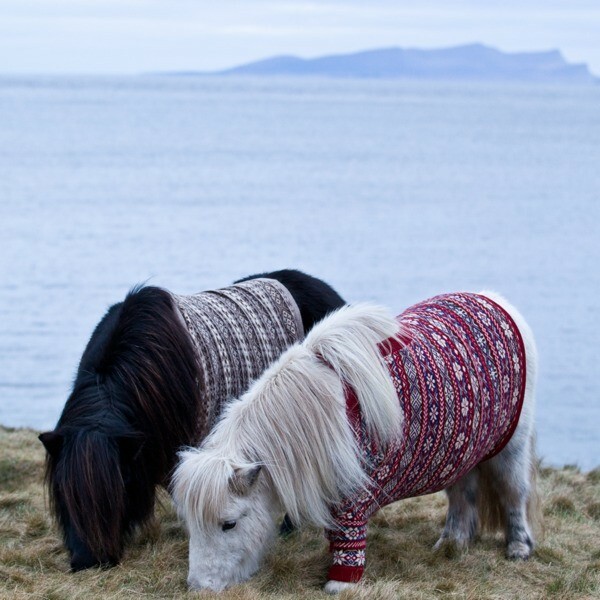 The ponies and their twee, wee sweaters made my day. 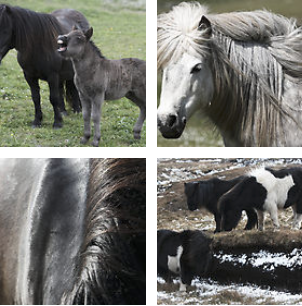 So sweet – they must be very laid back equines! 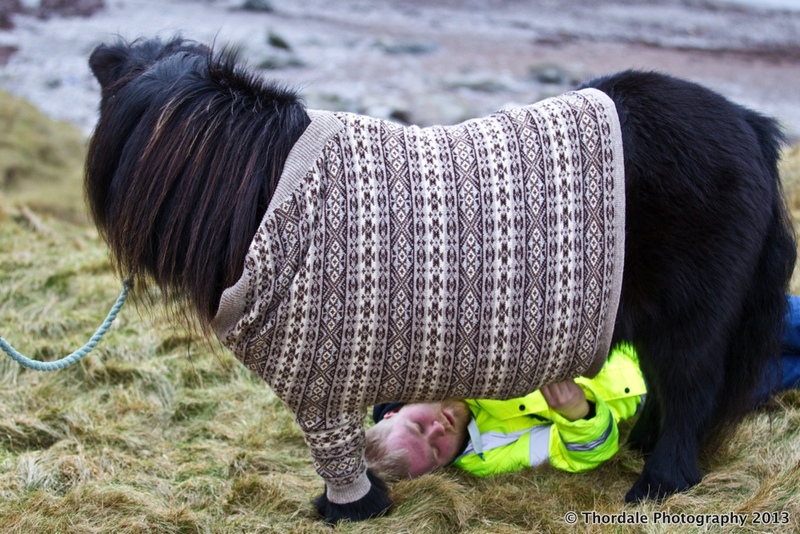 I am not going to try a Norwegian Sweater for my Fjord horse, that’s for sure! Thanks for sharing this. What Earwig said! Ignore the trolls and idiots. What you’ve shared with the world is too special. The negative noise will die down soon. Know that 99% of the people seeing your story are warmed by it and are delighted! VIral! – even ‘The One Ring’ Lord of the Rings Facebook page https://www.facebook.com/TheOneRingnet has now shared the image! Rather apt as my 35 and 34.5 inch pair are affectionately known as ‘The Hobbit Ponies’ and will come when called ‘Hobbits’. 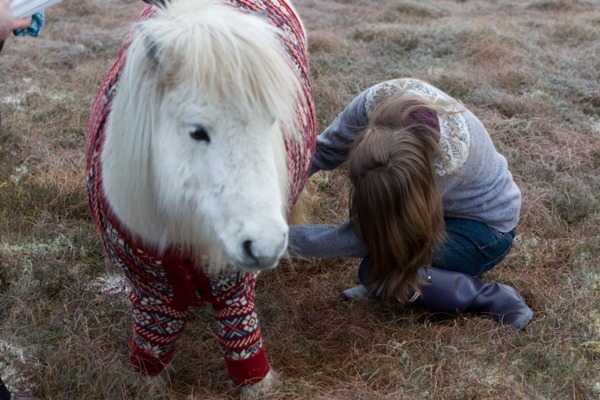 I happened to see your photos on Ravelry and then, coming here, discovered that you’re the family of the now incredibly famous ponies 😉 thanks for the wonderful background to the two girls and the shoot, as well as the shots of Shetland- they brought back lovely memories of a brief visit a couple of years ago…Happy day! 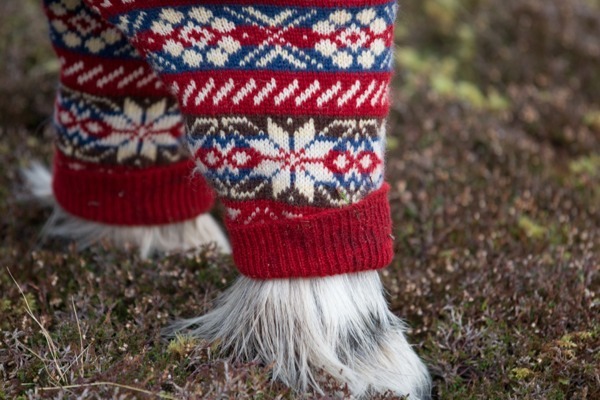 Lovely to hear from you, Jukes and I am glad that you see my photos on Ravelry! Come up and visit again! So cute! Impractical but cute! Just a thought for any knitter who cannot resist this temptation. If the buttons were in the back, it would be easier and safer for the persons doing the dressing and buttoning.